RjBeals wrote: Ahh... When you said "Left map sits on top of Right map" that is what confused me. I was thinking that it was like a 2nd layer "on top of" the first layer, like a downstairs and upstairs. Would this image design work better for everyone? You don't need to shout! Well.. It's hard to say. I prefer the previous version to this one, but only because I understand the attack routes now. If I (me personally) looked at this map for the first time, this version would clear up any confusion I had about the "on top of" verbiage. I take it though if you continued with the bonus structure between the columns, that you would remove the step area on the bottom. That really serves no purpose now. But I wish others would chime in. I'm surprised you've had this map out a few days now and you have such little feedback. Maybe folks are confusing this with Lower Egypt? But that's life in the foundry. I do like the graphics and overall style you have here. Fonts are fine. I know you said you will redo the statues on the sides. Sorry about the attack route confusion. Let's see what others have to say. RjBeals wrote: You don't need to shout! yes the steps would be removed and statues moved up. yes me too, even though both are in my signature and we aren't allowed to advertise in the GD forum anymore. wonderbar...thanks for that RJ....i was concerned that if a mapmaker like yourself was confused, then what would others be like! 4. changed left side attack routes from one to two. 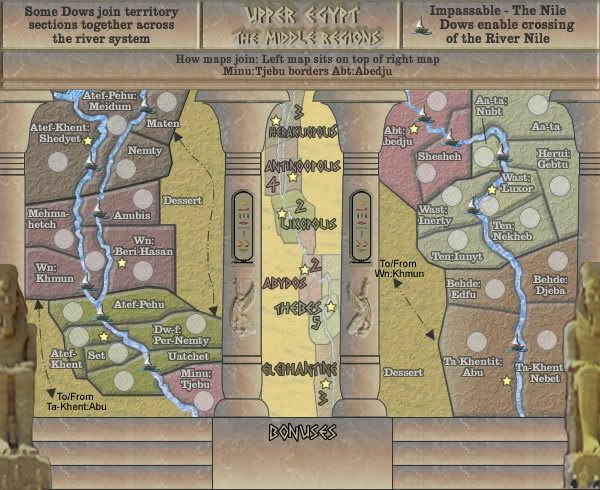 do the boats accross the river nile link terits? t-o-m wrote: do the boats accross the river nile link terits? Sorry t-o-m, but doesn't the legend say Dows enable crossing of the Nile, therefore one might assume that if you cross the NIle at these points then Yes, it would links terits. Thanks t-o-m, but what's there to be sorry about....i think we are both heading in the right direction aren't we? i'm improving the map and your growing to like it, that's gotta be positive. I like the bonus change so that it's between the two halves. It's still very readable and adds a little flavor to the pillars present, as if they're containing something. common peoples....i need support on this map to get it through as part of a quadtych for the egypt series. 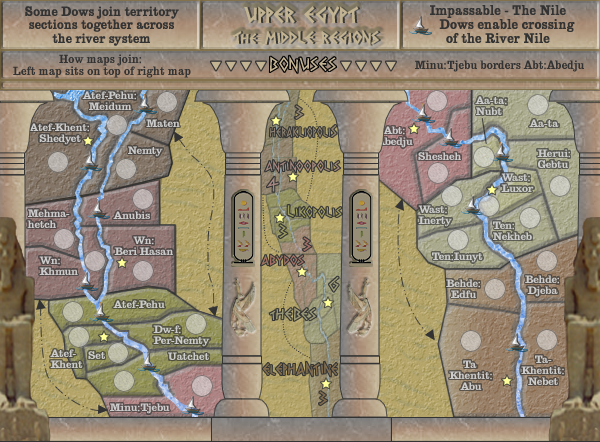 Re: EGYPT UPPER V4 - Comments needed please. are you working on the statue graphics (both on the far right & left of the map)? They look pretty bad. You would be better off to draw your own. RjBeals wrote: are you working on the statue graphics (both on the far right & left of the map)? They look pretty bad. You would be better off to draw your own. I think I mentioned this earlier cairns, and you shrugged it off. no i hadn't 'shrugged" it off at all! i simply stated that i would attend to that later, as i see it as not an essential part of this graphics elements right now. and yes i will draw my own. I like the map. Gameplay and bonuses seem fine to me at this point. My only comment is that the title could be more readable. The shadows make the title a bit strange looking. Honestly this map could be put up for live play today and be fine. edbeard wrote: I don't have any comments. Gees thanks edbeard...that's a big call....i'd better get it out of the ideas first with some more support....then i can fix the statues (make my own). Interested in Upper Egypt - a continuation from Lower Egypt? The colour schemes used are a bit too similar for my colour blind eyes. Can you do something like you did with the other Egypt map perhaps? Ruben Cassar wrote: The colour schemes used are a bit too similar for my colour blind eyes. Sure Ruben...what colours do you see best?? Btw welcome back into the foundry...it's good to see you have two maps up for development. 3) Is this the same type of water your using in lower egypt? if not, could u changet it to the same type? 6) Under bonuses u have mentioned curve like the others, could u either do as i suggested or modify the bonuses arrow to match the said arrow? 7) i noticed that the heiroglyphs are exactly alike on both pillars, maybe make them different? The one thing I don't like is the text at the upper left. We might as well try to make it as clear as possible. Maybe instead of, "Some dows join territory sections across the river system." say, "Note that some dows are use to join two parts of the same territory." Or something to that effect. Basically, I think expressly saying that some territories are split into two parts might be a good idea. Yes. This is very nitpicky, but it is a comment! could you put a bit of a shadow behind the map key and pillars? So it looks like they are in front of the map. right now everything just kinda runs together. You might want to clarify gameplay a bit, along the part where the two maps stack up. maybe at the bottom of the left map, you put a "connects to _____" text that helps explain how the gameplay works. wcaclimbing wrote: You might want to clarify gameplay a bit, along the part where the two maps stack up. maybe at the bottom of the left map, you put a "connects to _____" text that helps explain how the gameplay works. he says they stack up. and he says what territory borders what. I don't think you can get more clear than that.